O si yo, as they say in the Cherokee language, or hello. Those at all familiar with Texas history in the 1800's know of the Comanches, that fierce band of Plains Indians who reacted to white encroachment on their hunting grounds by raiding the settlements and murdering or kidnapping white settlers. But I thought it would be interesting to do a series on some of the lesser-known Indian tribes in Texas. I will begin with the Cherokee, for whom I have a soft spot since I am part Cherokee myself, about one sixteenth, if I remember my Texas family history correctly. The Cherokees were one of the so-called "Five Civilized Tribes" who had begun to adopt white ways of dress and living, including the same types of houses whites lived in and the keeping of slaves. 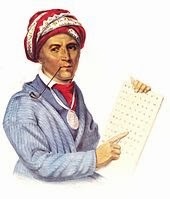 They had their own government, an 86-character alphabet (thanks to the famous Cherokee Sequoyah), and newspaper. The men dressed very colorfully with turbans and wide waist sashes over their American-style clothing, and Christianity was widely accepted. White settlers wanted their land, however, and when gold was discovered at the edge of Cherokee land, their fate was sealed, with President Andrew Jackson's help, despite their having helped defeat the British and Creek Indians in the War of 1812. After they were moved off their lands, the graves of those Cherokees who had died previously were robbed, after they were rumored to contain treasure. 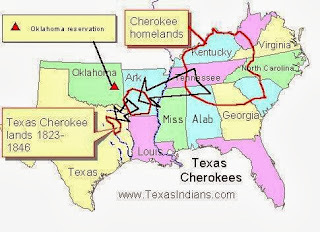 The Cherokees who came to Texas, though, did so before the Indian Removal Act led to the forced migration of the Cherokees to Oklahoma via the infamous Trail of Tears. A quarter of the 16,000 removed died. 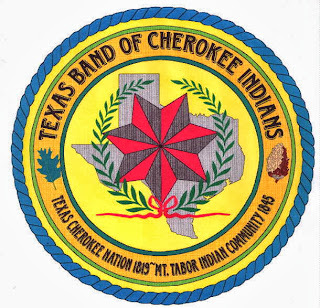 The Cherokees that I'm most likely related to followed Chief John Bowles, a Chickamauga, to first Missouri, then Arkansas, and finally east Texas in about 1812-1819, where they displaced the Caddoan tribe which had decreased in population thanks to exposure to European diseases. But they were never left in peace for long in Texas, either. Segments of the Texas colonial population, when Texas was still part of Mexico, and Mexico itself, frequently tried to use the Cherokees against Stephen Austin and his settlers and later against the United States, after Texas became a state. It wasn't long before the white settlers decided they wanted the Texas land the Cherokees had settled on, too, and the Cherokees were pushed farther and farther toward the plains where the warlike Comanche lived. Chief Bowles was even sent to try to make peace with the Comanches. The Texas Cherokees' great ally was Sam Houston, the first president of independent Texas, because he had lived among them. The second president, Lamar, however, hated all Indians including the Cherokee. When Mexico tried to use the Cherokees against the Texans, the Cherokees refused, but Texans didn't believe they weren't allies and instituted an act to remove them from Texas. In a battle in 1839 Chief Bowles and many other Cherokees were killed. Others fled to Mexico, where they were persecuted to an even worse degree. They returned to Texas at Birds Fort, and signed their last treaty in 1843, and were removed to Oklahoma, to join the eastern band of the Cherokee who had been there since the Trail of Tears. Just as when the eastern band was removed from Georgia and Tennessee, however, some Cherokee hid in Texas, many of them marrying whites, as my ancestor did, or passing as white. 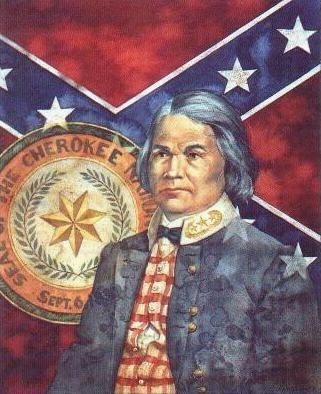 There were several Cherokees who fought with the Confederate States of America, most notably Brigadier General Stand Watie. I hope you've enjoyed this greatly condensed history of the Texas Cherokees. Until next month, Do na da' go hv i (goodbye)! This was really cool! It always makes me a little angry when I think of how the Indians were treated though to be honest based on how some groups of Indians treated whites I can kinda see where the early Americans were coming from but I still wish they could have found better ways to live side by side in peace. I just finished The Preacher's Bride a couple days ago and I loved it! I also have to say those Indian scenes were great, definitely had me at the edge of my seat! Haha that'd be late-I'm a crazy night owl. Growing up an introvert with 8 siblings I had to find some alone time and late was it so now I am generally the last asleep! Hi Maxie, thanks for commenting. Sounds like a lot of us have Cherokee/Indian blood. Thanks for telling me about yours! I almost don't want to say I enjoyed it. Fascinating history and to know this group of people are among your ancestors, Laurie, but it is such a difficult history to look back to and not feel disgust. Sadly, that IS history in so many ways. Mistreatment by one group over another because of power and greed. In NY, we have a few reservations where people have at least been able to come back to an area somewhat close to their ancestral lands. Debra, thanks so much for your thoughtful comments! I'm glad the topic spoke to you. The mistreatment of American Indians is something I will never understand. Thank you for sharing this most interesting post. Melanie, thanks for commenting. We certainly could have treated the native Americans better than we did, but it's so easy to judge in hindsight. I enjoyed your comments on this tribe and made me remember the "Trail of Tears" where so much heartbreak. Hi Paula, yes, those are the words in Cherokee for hello and goodbye. 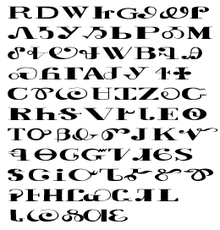 I once had a book and audiotape system for learning Cherokee, but sad to say, I never persisted in learning it. :) I'm not even sure what it sounds like. The phonetic alphabet looks very complex to me. Loved this post! Thanks for sharing Indian history. Will have to check out some of your books! Sally, thanks for commenting. I plan to do blogs on two more of the lesser-known Indian tribes of Texas in the next few months--I hope you'll enjoy those too.